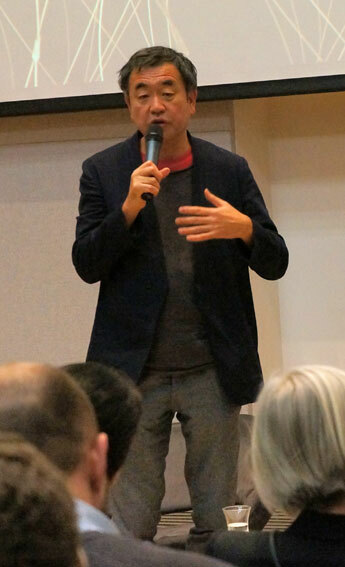 Japanese architect Kengo Kuma was giving a talk at the V&A museum titled “Power of Place”. V&A at Dundee museum in Scotland will be his first building in UK. Construction is due to start this summer. Kuma’s talk was focusing on his philosophy of balancing design with nature.The relationship between empowerment and architecture is the main interest for Kengo Kuma. He is seeking a new kind of harmony and relationship with nature and buildings. From the beginning of his career, Kuma’s approach is distinctive – buildings are literally merging and disappearing into the surrounding landscapes. He uses local materials and is respecting the local, historical references. Kuma mentions often ‘the void’ in his buildings. The void provides a passage and a view with a connection to the surrounding nature. He believes in circular nature and economy. The building becomes a part of the place. Kuma’s building structures are often based using cut sticks joint systems. They are very adaptable and can be constructed to make different shapes. In 2012 he designed a Starbucks cafe in Japan using just wooden sticks to support the building. Some of the sticks were up to 4 km long. Kengo emphasises that his work is not about decoration, instead it is about creating a structure with a simple and clever joint system technique. In 2012 Kengo designed a city hall to Nagaoka in Japan. In his view the problem of many city centers today is that the main activity for people happens outside the city centre. He wanted to re-activate the city centre with the new city hall. Kuma took inspiration from the concept of ‘doma’. In a typical farm house the doma is a semi-private area where people gather together. It provides intimacy, but it is a shared space. Traditionally doma has an earth floor. Kuma wanted to design a city hall with a doma space. Today the place is very busy and active also in the evenings. Kids are coming there to do their homework. For Kuma it is all about transparency. To prove his point he created an assembly room that is open to the plaza. New V&A Dundee museum is taken inspiration from the surrounding cliffs, seeking harmony with the land and water. Kuma wants to combine city with the nature. The design is repeating horizontal elements from cliffs. He wants to use local stone creating the texture facade. Interiors will be warm and soft with a lot of wood. The foyer is designed for events and to gather activity. Kuma’s view art and activity should be brought together. The museum has a more striking appearance and it stands out more from the landscape than Kuma’s previous buildings. The reason for this is that it reflects the strong nature of the river. Kengo Kuma & Associates are also one of seven international practices featured in critically acclaimed exhibition Sensing Spaces: Architecture Reimagined at the Royal Academy of Arts. Reflecting to his work at the exhibition Kuma explains that his focus is always to create maximum effect using minimum volume of materials and respecting the environment.